Throughout the MBA program, real world problems are used to facilitate student learning to provide value to the organization. Whether it is a marketing problem, a management problem, or an operations problem, a reciprocal relationship is established between organizations and MBA students. For example, Dr. Jim Grayson, Professor of Management Science and Operations Management, has been engaging the business community through projects in his courses for several years. Specifically, in the QUAN 6610: Designing, Managing, and Improving Operations class, teams of 3-5 students are formed. Next, the students identify an organization where they can facilitate a process improvement project. In most cases the organizations are selected based on student affiliations such as family businesses, employers, or clients Some recent collaborations include large organizations such as Club Car, John Deere, Georgia Power, Rec Tec, and TTX Company and smaller organizations such as Smart Style Salon, Mathnasium, Shannon Rolling Real Estate, Fat Man’s Café, and Urgent MD. Partnerships with non-profit organizations such as the Hope House and government organizations such as the Aiken County Jail have also been established. Even Augusta University has benefited from their own students working on projects for the Dental College of Georgia, Georgia Cancer Center, and the Children’s Hospital of Georgia. As the students work with these organizations, they are required to identify, define, measure, and analyze a process and then provide suggestions for improving and controlling the new process. The students compile their findings and present their recommendations to the organizations. In many cases, cost saving recommendations were implemented and the organizations stated that they were impressed with the level of detail that went into the research and the overall quality of the project findings. These relationships between the students and the organizations are mutually beneficial. 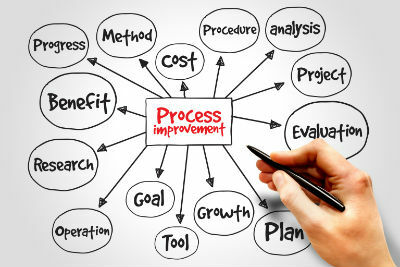 The students are able to apply process improvement techniques learned in class within a controlled learning environment and the organizations benefit from the suggestions yielded from the project. This is a great investment for both students and for the organization.